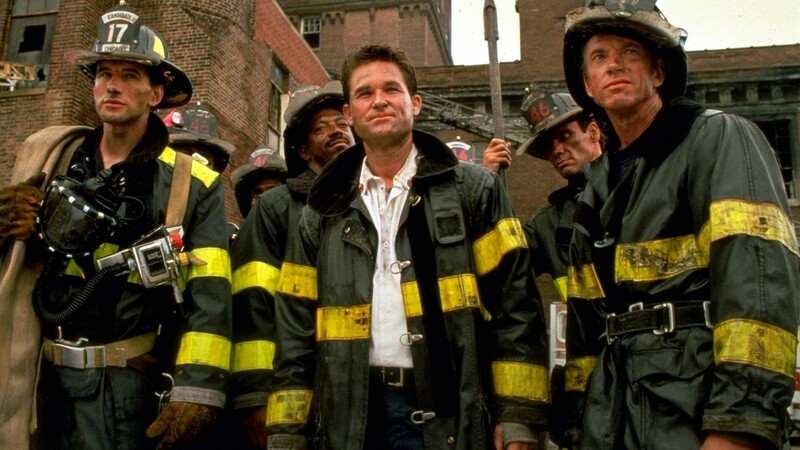 An ode to firefighters with an all-star cast, Backdraft is full of flames and overflowing with machismo. When the fires are burning the spectacle is superb, but the story and characters are a bit singed. As a young boy, Brian McCaffrey was a witness as his firefighter father died heroically battling a blaze in Chicago. Having struggled to define himself as an adult, Brian (William Baldwin) finally graduates from the firefighting academy and joins his older brother Steve (Kurt Russell) at Engine 17. Brian and Steven have never really gotten along, with Steve (nicknamed Bull) being the aggressive, fearless type, naturally taking after his father, while Brian is much more hesitant and unsure. John "Axe" Adcox (Scott Glenn) is a veteran member of Engine 17, and the man whose life was saved when the senior McCaffrey perished. 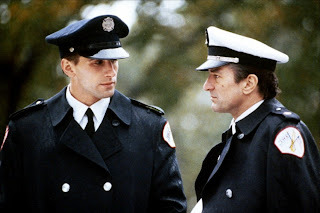 With local politician Martin Swayzak (J. T. Walsh) waging a cost-cutting war against Chicago's fire department with the help of his assistant Jennifer (Jennifer Jason Leigh), a string of suspicious, carefully planned fires take the lives of prominent businessmen in Chicago. Inspector Donald "Shadow" Rimgale (Robert De Niro) investigates the fires, and when Brian decides that firefighting may not be his calling after all, he joins Donald's investigative team. They eventually turn to legendary arsonist Ronald Bartel (Donald Sutherland), now incarcerated, to try and untangle the clues to the murderous fire spree. Backdraft is easily at its best when the fires are burning. Ron Howard stages the firefighting scenes with a riveting intensity, perhaps unrealistically clearing the air of visibility-obscuring smoke but otherwise developing excellent tension and capturing the pure danger of buildings being devoured by an out of control fire, and firefighters having to balance extinguishing the flames with maintaining their own safety. Heroism and stupidity walk hand in hand, and in the character of Steve McCaffrey the film finds a man who is comfortably both courageous and brainless. And despite the cast at his disposal, Howard succeeds in making fire itself his central character. The film veers into no small amount of mysticism in presenting fire as a living entity, a breathing, eating monster with a mind of its own once unleashed. A lot of it is hogwash, but in the context of movie entertainment, the metaphysical angles overlaid on spooky smoke lurking behind closed doors works quite well. The story-development and character-evolution scenes are less exciting. The script by Gregory Widen, who worked as a firefighter for three years, packs a few too many clichés and messy character relationships, most awkward being Jennifer as the ex-girlfriend of Brian. Jennifer Jason Leigh is uncharacteristically flat and off-form, her independent persona seemingly lost in the capacious surroundings of a Hollywood blockbuster. As Steve, Kurt Russell's hot-headed drink first, punch next, and maybe think later portrayal gets tiresome, and the tension between the brothers is there just because the film needs it. But overall the cast of stars is never less than good, with Sutherland most hysterically memorable as the arsonist with eyes betraying the pure love of destructive fire residing in his soul. But as tends to happen with a star in every role, there is precious room for interesting transformations, despite the 130 minutes of running time. Rebecca De Mornay is almost totally wasted in a truncated role as Steve's ex-wife. 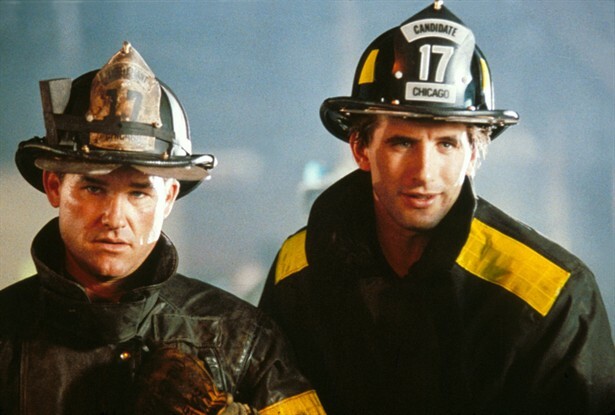 Backdraft celebrates the power of infernos and the men (and they are all men in this movie) who put their lives on the line to battle them. The film does encounter some cold spots, but burns past them, sirens blazing.